The Recurring Events Manager add-on for Event Espresso allows event admins (event creators) to create a batch of similar events at the same time. This saves time by allowing you to quickly build out events instead of creating each one individually. Need to Buy a Support License for the Recurring Events Manager Add-on? This add-on requires Event Espresso 3.1.33 or newer. It cannot be used with old versions of Event Espresso 3. This add-on is a plugin for WordPress and can be installed through your WP dashboard (WP-admin). Download the latest version of the Recurring Events Manager add-on for Event Espresso 3 from your Event Espresso account. Then login to your WordPress dashboard (WP-admin) and go to Plugins. Next, click on Add New –> Upload and browse to the plugin on your computer. Then select the zip file and begin the upload process. Wait for the plugin to upload and then click on Activate. Login to your WP dashboard and go to Event Espresso –> Events Overview –> Add New. You’ll now be viewing the event editor for Event Espresso. 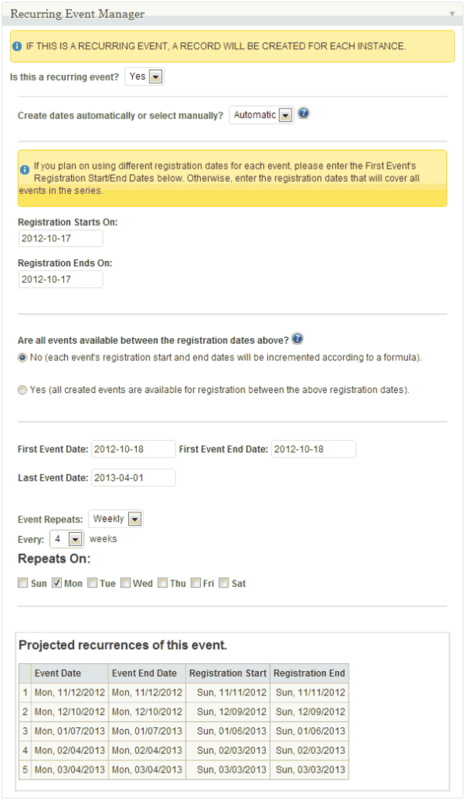 Begin setting up your event by adding an event name, description and setting up event times. 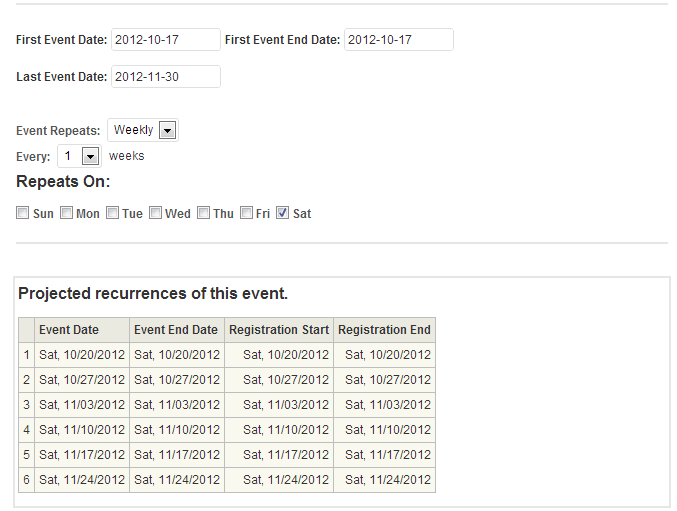 Below the event times section, you’ll see a new section for the Recurring Event Manager. By default, the recurring event option is set to no. In the next section, you’ll learn how to create a recurring event. 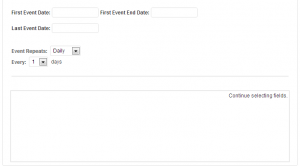 The Recurring Events Manager add-on is helpful for build out a set of events that are similar. The add-on works by using a new event as a template and creates additional events based on the schedule that you select (e.g. create events that span across a few weeks, a few months, a year, etc). Create as many events in the future as you like. Event Espresso will automatically open and close registrations for all of your recurring events. After installing the Recurring Events Manager (REM for short), you wont see a menu item, instead the feature will appear in the event details page (when you are adding a new event). An existing single event cannot be converted into recurring series. To setup a recurring event, select Yes to the question: Is this a recurring event? The following options will become available. Create dates automatically or select manually? : Selecting automatic here is generally the way to go unless you have an erratic schedule of classes/events. The automatic system asks some questions which don’t appear to be straight forward initially, but are quite simple to master. Selecting manual here, means more work for you but allows a greater degree of flexibility, especially when dealing with erratic schedules. Registration Starts On: This is for the first registration date of the first event/class in the series or the first date of the registration period. Registration Ends On: This is for the last registration date of the first event/class in the series or the last date of the registration period. Just to be clear here, those two dates will either be for the first event in a series of events that each have their own registration period OR those dates will cover a broad period of time in which a customer can register for any event. No: Use this if each event in the series will have its own registration start and end dates. Make sure to enter the First Event’s Registration Start and End dates above. This would be used if you want the registration for an event to be, for example, two weeks before the event starts. Every time the event happens, the registration for that event will open two weeks before the event and close on or before that particular event (depending on when you choose the end date). The automatic calculation is based upon how you setup the first event; the following recurring events will function just like the first event. For example, if you open registration 2 months before the event starts, and close it 3 days before the event, the registration window for the recurring events will be the same (not the same dates, the same length of time). Yes: Use this if all events are only available between the above registration start and end dates. This is useful if you only want people to register for an event during one time period. For example, if you have five events, but you want everyone to register up to 1 week before the first event, you can open and close registration for all those events at once. If you have selected the Automatic option above, here’s what you will see. If you have selected Manual, see below. First Event Date: The date that your first event begins (not the registration period, but the actual event). First Event End Date: The date your first event ends. Event Repeats: Choose between daily, weekly or monthly repetition. Every: Choose a number to represent how often you want it to repeat. If you have chosen weeks or months in the above option, you will also see further options (days of week and day of month/day of week, respectively). Once your options have been chosen, the system generates the list in the box below the options to show you how your recurring events will look. Changing your options will refresh this list. An example would be my events run every saturday, with individual registration periods. Using the option in the example image I have set up recurring events for the next 6 weeks. 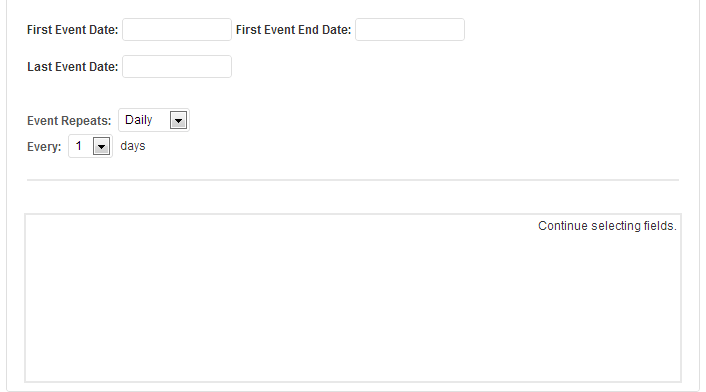 Choosing the manual option will show 2 field boxes where you can type in your first events start and end dates. Using the icon, you can add as many events as you want. The icon removes events. Remember to start with your first event and create them in date order. The plugin will not activate. Can you help? Are you running a current version of Event Espresso 3? Can an existing event be switched to a recurring event? 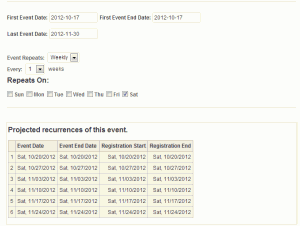 No, recurring events can only be created while you are creating a new event using the event editor for Event Espresso. I created a set of recurring events but I need to change one. Making a change to one recurring event in a series will not automatically change all other events. Our support team cannot write custom coding for you. Below are some examples on customizing this add-on. There are a set of templates available that can be customized. They are located in /wp-content/espresso-recurring-events/recurring-event-templates. Inside are two event list templates. These files can be added to your wp-content/uploads/espresso/templates/ directory. Be sure to backup your WordPress before making changes. Need an Event Espresso 3 support license?